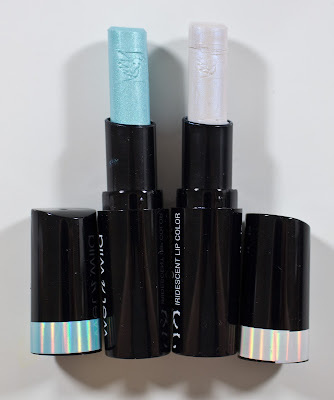 Wet n Wild Unicorn Glow Collection: Rainbow Highlighter in Everlasting Glow, Unicorn Glow, & Bronze Over The Rainbow, MegaLast Iridescent Lip Color in Unicorn Soul, Immortal Tears & Unicorn Highlighting Brush. Update: Wet n Wild MegaLast Iridescent Lip Color in Unicorn Soul lipstick and Wet n Wild Rainbow Highlighter in Unicorn Glow is also a part of the Fantasy Makers Halloween makeup displays this year in Canada. The Wet n Wild Rainbow Highlighters retails for $5.99US for 0.26 oz. /7.5g of product. The MegaLast Iridescent Lip Color retail for $2.99US for 0.11 oz / 3.3g of product each. The Unicorn Highlighting Brush retails for $4.99US. This collection is not sold in Canada at all, and I had to order these through the wet n wild online shop. The ship with FedEx ground and everything came in relatively good condition other than the lipsticks where left to rattle around the box. The only thing I didn't get from this collection was the 3 Color Icon Pigments at 2.99US. I own so may pigment already, so I just wasn't interested in those. Wet n Wild The Rainbow Highlighter in Unicorn Glow, Bronze Over & Everlasting Glow. Wet n Wild Rainbow Highlighter in Unicorn Glow. Wet n Wild Rainbow Highlighter in Everlasting Glow. Wet n Wild Rainbow Highlighter in Bronze Over The Rainbow. Wet n Wild MegaLast Iridescent Lip Color in Unicorn Soul, & Immortal Tears. Wet n Wild Unicorn Highlighting Brush, inside packaging. Wet n Wild Unicorn Highlighting Brush, back for packaging. 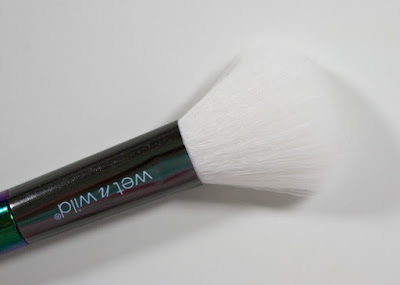 Wet n Wild Unicorn Highlighting Brush. 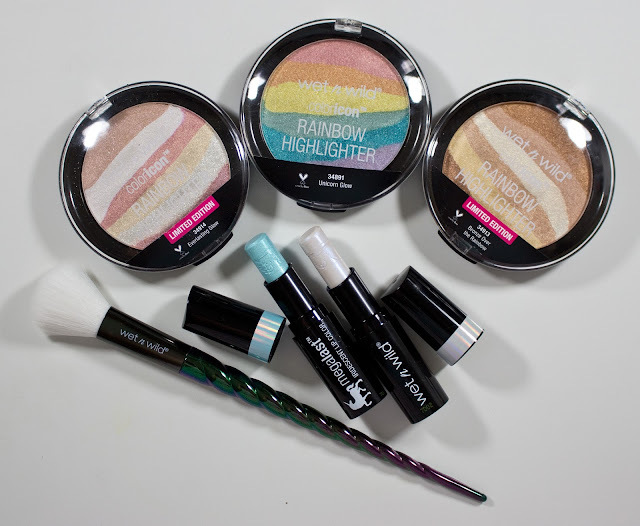 Wet ‘n’ Wild Unicorn Rainbow Highlighter: Synthetic Fluorphlogopite, Boron Nitride, Caprylic/Capric Triglyceride, Octyldodecyl Stearoyl Stearate, Ethylhexyl Palmitate, Ethyl Macadamiate, Magnesium Aluminum Silicate, Nylon-12, Dimethicone, Trimethylsiloxysilicate, Lauryl PEG/PPG-18/18 Methicone, Bis-Diglyceryl Polyacyladipate-2, Cetyl PEG/PPG-10/1 Dimethicone, Hexyl Laurate, Polyglyceryl-4 Isostearate, Phenoxyethanol, Caprylyl Glycol, Lauroyl Lysine, Ethylhexylglycerin, Hexylene Glycol, Dodecene, Isostearyl Alcohol, Xanthan Gum, Tin Oxide, o-Cymen-5-ol, Water/Eau, Diethylhexyl Syringylidenemalonate, [+/- (MAY CONTAIN/PEUT CONTENIR): Mica, Titanium Dioxide/CI 77891, Iron Oxides/CI 77491, CI 77492, CI 77499, Ferric Ferrocyanide/CI 77510]. MegaLast Iridescent Lip Color: Tridecyl Trimellitate, Caprylic/Capric Triglyceride, Polybutene, Diisostearyl Malate, Bis-Behenyl/Isostearyl/Phytosteryl Dimer Dilinoleyl Dimer Dilinoleate, Polyethylene, Isononyl Isononanoate, Triheptanoin, Ozokerite, Isostearyl Isostearate, Triisostearin, Microcrystalline Wax/Cire microcrystalline, Silica, Synthetic Fluorphlogopite, Dimethicone/Vinyl Dimethicone Crosspolymer, Astrocaryum Murumuru Seed Butter, Pentaerythrityl Tetraisostearate, Phenoxyethanol, Malic Acid, Sorbic Acid, Hydrogenated Lecithin, Citric Acid, Tin Oxide, Titanium Dioxide/CI 77891, Mica, Red 27/CI 45410, Blue 1 Lake/CI 42090. 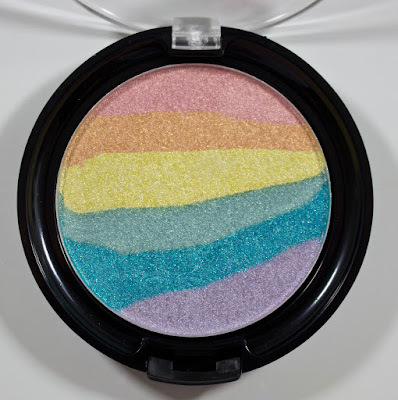 The Wet n Wild Rainbow Highlighter formula is a shimmery metallic mica finish with high shine. I found that the Everlasting Glow and Bronze Over The Rainbow have a softer texture in the pan and higher shine compared to the original shade of Unicorn Glow that made them easier to work with. The pan of Unicorn Glow the shade where sheerer and stiffer in the pan to work with, but the finish on the skin was more of a sheer glow than high frost shimmer. Although the MegaLast Iridescent Lip Color shares the MegaLast Lip Color name, the formula is much simpler by comparison. This means it doesn't last as long as the MegaLast Lip Color lipsticks but this formula is meant to hold only shimmer mica and a colour change tint on the lips. I found these VERY comfortable to wear. Although I can not call them hydrating the didn't feel dry on the lips either. The Unicorn Highlighting Brush is a white nylon synthetic brush that the bristles are designed to mimic goat hair brushes. This is not my favourite synthetic hair texture compared to my higher end synthetic brushes, it just feels cheaper. But it feels soft on my sensitive skin and does a good job at applying powder products in general. The white bristles make it easier to see which colours you have on the brush. Stripe 1 is a pale rose pink with a shimmer finish. Stripe 2 is a white with a pale violet shimmer finish. Stripe 4 is a pale yellow gold with a shimmer finish. Stripe 5 is a warm pearl with a shimmer finish. Stripe 6 is a warm rose/copper with a shimmer finish. Mixed together is a pale pink with high shine highlighter. Stripe 1 is a light pink with a shimmer finish. Stripe 2 is a light orange with a shimmer finish. Stripe 3 is a light yellow with a shimmer finish. Stripe 4 is a with a mint shimmer finish. Stripe 5 is a turquoise with a shimmer finish. Stripe 6 is a pale lavender with a shimmer finish. Mixed together is a pale gold green shift white highlighter. Stripe 1 is a deep gold/bronze with a shimmer finish. Stripe 2 is a dusty gold with a shimmer finish. Stripe 3 is a bright gold in a white base with a shimmer finish. Stripe 4 is a light gold with a shimmer finish. Stripe 5 is a light yellow gold with a shimmer finish. Stripe 6 is a bronze with a shimmer finish. 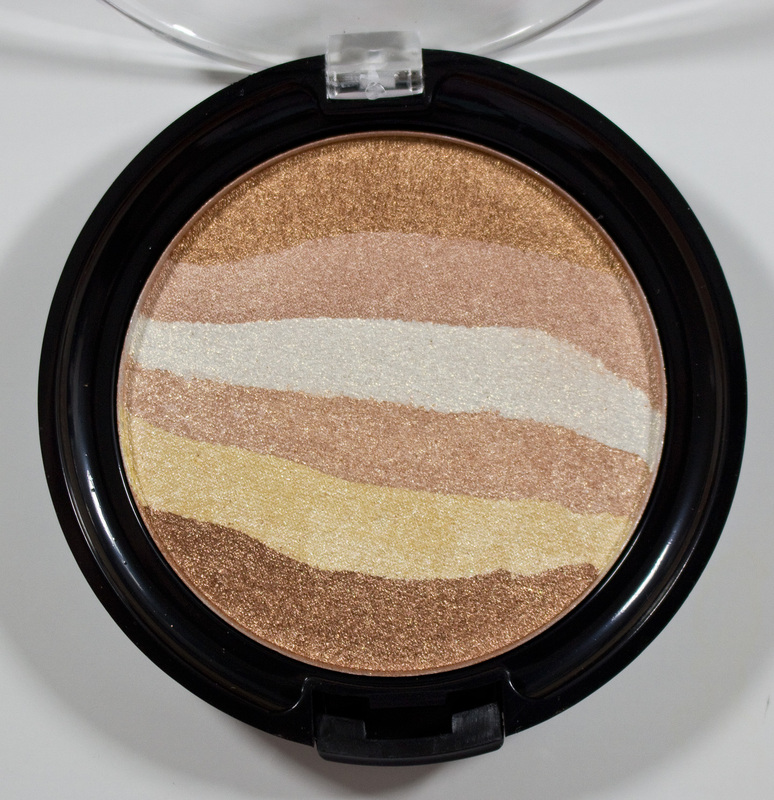 Mixed together is a bronze gold highlighter. This one would work for medium to deep skin tone as a highlighter. This is way more of a shimmer bronzer for light to medium light skin tones. Unicorn Soul is a sheer base that turns mauve based on your body temperature, with pale turquoise micro shimmer. Immortal Tears is a clear base colour with pale blue that shifts violet micro shimmer heavily throughout. The MegaLast Iridescent Lip Color lipstick I get 4-5 hours wear before needing to touch up the shimmer. The Unicorn Soul stain base colour I get close to 7 to 8 hours wear before it starts to actually wear off the lips. Packaging: The Rainbow Highlighters are housed in a clear domed lid compact with a button open closure. I really like this packaging so hopefully with will see more of their powder products in it. 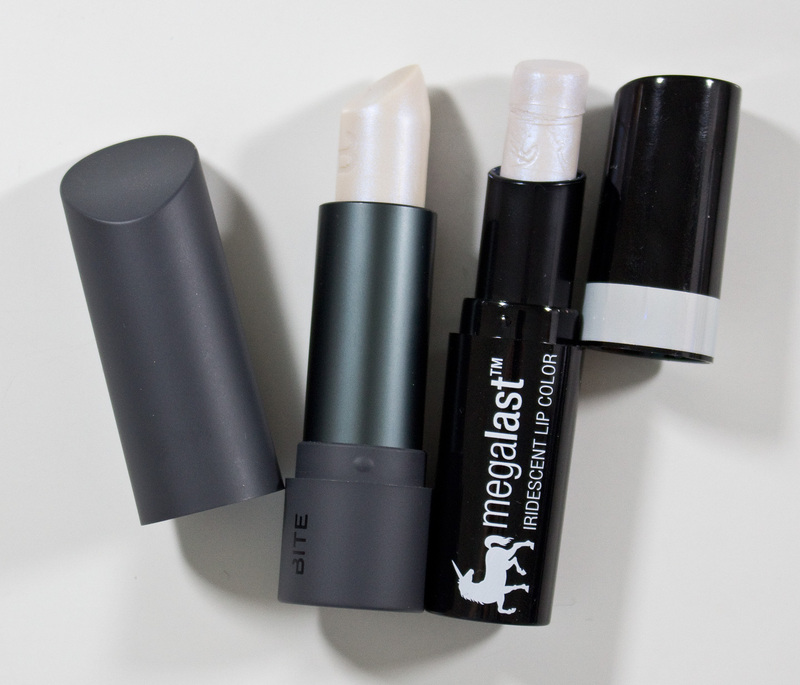 The MegaLast Iridescent Lip Color, lipstick tube is the same shape as the rest of the MegaLast Lip Color but it's all a solid black with a foil sticker to mark the colour on the lips. 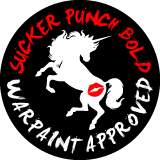 The lipstick bullet has a unicorn head stamped into it as well for the extra touch. The Unicorn Highlighting Brush has a gunmetal ferrule with a black base oil slick colour unicorns handle. I think the components are all plastic instead of metal just from the lightweight of the brush as a whole. Daylight swatches: Wet n Wild Rainbow Highlighter in Everlasting Glow. Shades Stripes 1 through 6 switched out and the shades all mixed together. 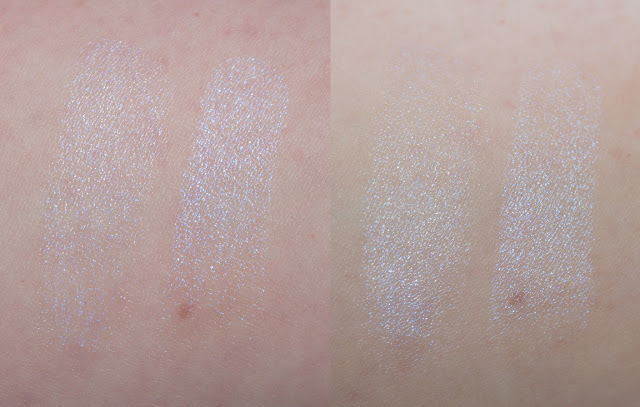 Flash swatches: Wet n Wild Rainbow Highlighter in Everlasting Glow. Shades Stripes 1 through 6 switched out and the shades all mixed together. Daylight swatches: Wet n Wild Rainbow Highlighter in Unicorn Glow. Shades Stripes 1 through 6 switched out and the shades all mixed together. 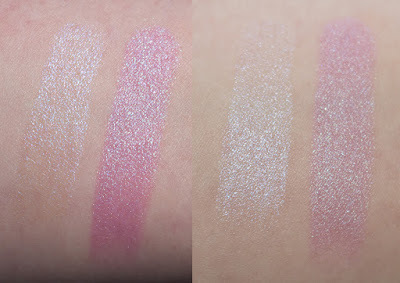 Flash swatches: Wet n Wild Rainbow Highlighter in Unicorn Glow. Shades Stripes 1 through 6 switched out and the shades all mixed together. Daylight swatches: Wet n Wild Rainbow Highlighter in Bronze Over The Rainbow. Shades Stripes 1 through 6 switched out and the shades all mixed together. 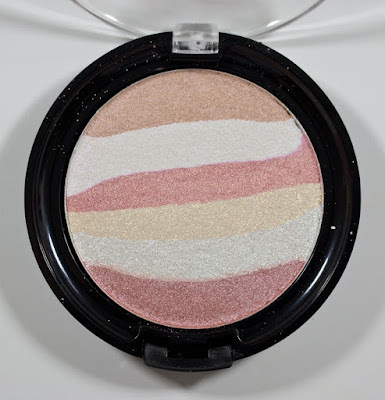 Flash swatches: Wet n Wild Rainbow Highlighter in Bronze Over The Rainbow. Shades Stripes 1 through 6 switched out and the shades all mixed together. Daylight & Flash swatches: Wet n Wild MegaLast Iridescent Lip Color in Unicorn Soul, & Immortal Tears. Wet n Wild MegaLast Iridescent Lip Color in Immortal Tears. Wet n Wild MegaLast Iridescent Lip Color in Unicorn Soul. Bite Beauty Crème Lipstick in Opal & MegaLast Iridescent Lip Color Immortal Tears. Daylight & Flash swatches: Bite Beauty Crème Lipstick in Opal & MegaLast Iridescent Lip Color Immortal Tears. The Bite Beauty Opal Crème Lipstick is very similar to the MegaLast Iridescent Lip Color in Immortal Tears. 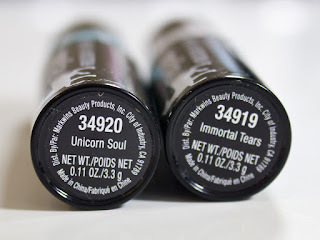 I found Immortal Tears was more opaque compared to Bite Beauty Opal Crème Lipstick and less violet in colour. I'm not a fan of notable shimmer in my highlighters, so it should not be a surprised I'm not a fan of the Everlasting Glow and Bronze Over The Rainbow. But there is nothing wrong with the products themselves just not my cup of tea. Unicorn Glow, I found interestingly workable as both a streak higher to get the rainbow effect and as a natural highlighter blended together. You're going to want to apply the streaks in two stages of the pan to get the clean looking rainbow or use a fan brush to get each ribbon of colour separately. My favourite product surprisingly was the Wet n Wild MegaLast Iridescent Lip Color in Unicorn Soul the colour tint with even pale turquoise shimmer was just perfect on the lips, and I don't think I've ever gotten so many comments on my lipstick compared to this one while wearing it. Immortal Tears is also an excellent way to add shimmer to any lipstick if your not a gloss girl like me.